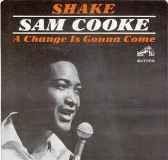 This week’s subject is Sam Cooke’s Civil Rights protest song A Change Is Gonna Come and what inspired him to record it was hearing Peter Paul and Mary’s rendition of Bob Dylan’s Blowin’ In The Wind on the radio. What spurned him on further was, according to You Send Me: The Life and Times of Sam Cooke by Daniel Wolff was, “the folk trio piqued Cooke’s commercial ambitions.” Their recording proved that “a tune could address civil rights and go to number two on the pop charts.” His only disappointment was that when he first heard it he thought it should have been written by someone of his own colour, but it never stopped him adding to his own repertoire when playing live. While this might well be true, the song’s sentiment is much closer to Jerome Kern and Oscar Hammerstein’s 1927-penned song Ol’ Man River which appeared in Showboat nine years later and made famous by Paul Robeson. In Ol’ Man River, Robeson sings, ‘I gets weary and sick of tryin’, I’m tired of livin’ and scared of dyin’,’ and Cooke opened his second verse with ‘It’s been too hard living, but I’m afraid to die’. Sam Cooke, who was arguably one of the most successful and popular black soul singers ever, was born Samuel Cook in Mississippi in 1931 and was one of the few who wrote his own songs. He has been called ‘the inventor of soul music’ and also known as ‘King of soul’ because in his short life he influenced so many artists including Aretha Franklin, Stevie Wonder, Otis Redding, Marvin Gaye, Al Green and Curtis Mayfield among many others. In the mid-50s he decided to add an ‘e’ to his surname and joined a doo-wop group called Johnny Keyes and the Magnificents. In 1957 he launched a solo career kicking off with You Send Me and added a further 39 hits in the States up until his death in December 1964. His first UK top 10 hit was Chain Gang in 1960, Cupid the following year and Twisting the Night Away the year after that. His biggest success over here was Wonderful World when it reached number two when re-issued in 1986 following its inclusion in a Levi Jeans commercial. There’s nothing like getting some assurance from someone you know and trust when you’re proud of something you’ve done and so he took to his protégé, Bobby Womack, who, after hearing it through once said, Cooke said to him, “What’s it sound like?” to which Bobby replied, “It sounds like death.” Cooke said, “Man, that’s kind of how it sounds like to me. That’s why I’m never going to play it in public,” then Bobby had a rethink and said “Well, it’s not like death, but it sounds kind of spooky.” Bobby was obviously not ready for this departure, it was clearly the first time that Cooke had addressed social problems in a direct and explicit way. “It was a complex arrangement with something like 17 strings,” Guralnick confirmed. “I think part of him felt, ‘I’m not gonna do it if I can’t do justice to it.’ But the other part was that it had this kind of ominousness about it. Cooke didn’t want to alienate his audience when he was out on the road, but equally he could not ignore moral outrage right in front of him. The audience were with him. There was much controversy, confusion and contradiction that surrounded his death when he was shot at the Hacienda Motel in Los Angeles by the manageress, Bertha Franklin, who claimed she shot Cooke in self-defence after he broke into her office and attacked her. To this day, nobody quite knows the full story, but at his funeral in Chicago, over 200,000 people filed past his coffin to pay their respects. A Change Is Gonna Come first appeared on the album Ain’t That Good News in March 1964 and eventually released, posthumously, on the B-side of Shake in January 1965, just four weeks after his death. Guralnick says, “A Change Is Gonna Come is now much more than a civil rights anthem, it’s become a universal message of hope, one that does not age.” The song was given to Adam Lambert to perform on American Idol and was also performed by Jon Bon Jovi and Bettye LaVette at President Obama’s inauguration celebration in 2009.